This recipe is perfect if you are lazy, in a hurry, hungry, or any combination of the three. The part about cinnamon rolls I hate is waiting for the yeast to rise! I know it some recipes it is crucial (pizza rough, etc) but for cinnamon rolls I feel like it’s over kill. The alternative to yeast, is baking powder. Which all my chemists out there will understand- adds more gas bubbles into you food creating a more “cakey” final product. But for me I want my cinnamon rolls to be cakey and fluffy! So I said buh-bye to the yeast and proving time, and hello to instant delicious homemade cinnamon rolls! I hope you enjoy 😊. For the filling, in a small bowl combine butter, brown sugar and cinnamon to form a crumble. In a large bowl mix together flour, sugar, baking powder, and salt. Stir in milk(or nog) to form a soft dough. Roll out dough on a lightly floured into a rectangle about 1/4 inch thick. Spread the filling on the rolled out dough. Roll up the rectangle, with a sharp knife slice into 18 small rolls about 1inch thick. Bake for 20-25 min at 400°F. For frosting, whip butter and cream cheese in a kitchen aid mixer (or use a hand mixer) until light and fluffy. Add powdered sugar and salt. Slowly add in milk (or nog) and whip until combined. Let cinnamon rolls cook for 10 min so they are still warm enough to slightly melt the frosting but not hot enough to make it gross and runny. I am 2 days into my “dedicated study” time for boards, yikes. We finished our block up last week, and we had a week off! I spent that time seeing friends and relaxing and trying not to think about boards. However, now I am back to it, studying daily. I think I’m going to do a separate post about my “plan of attack” and how I intend to allot my time, and I think it will be fun to come back to the post after boards and tell you what I liked, didn’t like, what I changed, etc. Hopefully this can help rising M2’s on their board journey! I’ve been so good about running daily, and I’m actually really proud of myself. Even over my week off I only took 3 days off out of 10, which isn’t bad! For now, I’ll keep this post pretty short with a delicious recipe. I got inspiration for this recipe from The Great British Baking Show (FYI – I am obsessed with this show. It is so good!). Enjoy! Preheat to 350. This recipe is so much easier than it looks! All I did was sauté all the vegetables up separately, then I placed them each in their own bowl to the side. I added the saffron in to the cooked rice to give it the beautiful color. And I sautéed the garlic with the mushrooms. Feel free to add salt and pepper if you’d like. After this, I placed my pastry dough in a bread pan, and began layering it with the vegetables. I made an doable lattice crust for the top of mine, but you definitely don’t need to do that. Brush the top of the pastry with the egg wash (egg white with water mixture). Pop in the oven for around 40 min, or until the top is crisp and golden brown. Let cool, enjoy! As boards are approaching and so is the end of my second and final year in the med school classroom (PRAISE!) I’ve been so so busy. I can’t wait until this beast of an exam is over and I can finally live my life again! For now, I leave you with this amazing recipe that you must must try! Preheat oven to 350. Mix together flours, baking powder, salt and cinnamon in separate bowl. Set aside. In electric mixer, cream butter and sugar. Add eggs and vanilla. Mix for a minute or two. Next, add in some of the flour, then some of the milk, alternating between the two until they are all in the bowl. Mix until batter is smooth. Pour into cupcake liners – I use these and love them! My cupcakes always come out perfect! Cream butter alone in electric mixer for ~2 minutes. (THIS IS THE KEY TO FLUFFY FROSTING). Next, add the confectioners sugar. Mix for another 3-4 minutes until frosting is light and fluffy. Add milk and vanilla. Mix for another minute or so. Once cupcakes are completely cool, frost them! Top with cinnamon sugar if you’d like! For the “cake” part of these cupcakes I used one of the best cupcake recipes I’ve found, yet! I made a few changes to it for this recipe but they were perfect! I really hope you enjoy them, these were some of the best cupcakes I’ve made ever! I brought a plate of these to the residents I was working with the other morning and they scarfed them down. Thats my number one tip as a medical student – always bring treats for everyone! Most people in my life know that I have a huge love for baking. Cupcakes, cake, cookies, I love it all. This week I wanted to whip up a special treat because I’ve been swamped with exams, but the worst part is, when I have a few days off from exams I’m studying for boards. So there really isn’t any time off right now which its hard and exhausting. So to counteract the bad vibes that UWorld and Pathoma are giving me (those are my board study resources, for those of you not in medical school… haha) I decided to bake! These cupcakes were so good, I had to give them away to anyone and everyone to keep me from eating them ALL. I’m actually not even a huge chocolate fan, but these were good. This is the recipe for the frosting, I just used a vanilla cupcake recipe for the actual cupcakes. With an electric mixer, cream together the butter and the brown sugar. Add salt and vanilla. Mix. Add flour slowly. Mix. Add milk, a little splash at time. This way your frosting will stay fluffy. Finally, manual stir in the chocolate chips. ENJOY! I have a wonderful recipe today that is perfect for two. I thought this would be a nice recipe to put up before Valentine’s Day because it’s super easy but also is a really nice treat! Preheat oven to 500. Thaw the spinach in the microwave, squeeze all water out. Add all the cheese (Ricotta, mozzarella, Parmesan), garlic, pepper and salt. Split dough into 4 pieces and roll out each of the pizza dough into a circle on a cutting board. Fill half the circle with the spinach filling and hold the dough over. Pinch the endges and cut three 1in slots in the calzones. Wish egg, egg white and water in a bowl and gently brush over the dough. Pop in the over until golden brown. Enjoy! Yesterday it hit 28 degrees. I couldn’t believe it… I ran in shorts and a tank top the day before! How crazy is that? I went to evening mass on Saturday (because Sunday mornings are my favorite study times) and it was flurrying (sp?) SNOW! I obviously grew up in the desert because I love snow, and I get overly excited when it begins to snow. Everyone here makes fun of me but I don’t even care! Winter is by far my favorite season. Since the cold weather came on rather quickly, I want to make something warm and cozy for dinner. This recipe is super cheap, super easy, and makes a ton of food! I’m pretty sure we will be eating it for a couple of days and I even shared it with my roommates! I only have 1 more exam and a clinical procedure lab before I’m free for Thanksgiving Break! I have a fun idea to share some of my Thanksgiving recipes with you all, so stay tuned :-). In a large pot, heat coconut oil in bottom, add onion and garlic and sauté until onion is translucent. Add flour and chili powder. Rinse and drain all 3 types of beans and add to pot. Add corn, diced tomatoes, tomato sauce, and veggie broth. Heat throughout. Add noodles. STIR constantly for 5-7 minutes (or until noodles are cooked). Do not let this sit for too long, I learned the hard way it will burn and stick to the pot :-). Remove from heat, add in the cheese and stir until melted. Serve. Enjoy! Another block down, and only 2 more to go! How crazy is that?! We have happily transitioned into Block 6 now, but I wanted to reflect on the rigors of Block 5. Our Block 5 was GI and Nephrology. This block was literally “bittersweet” because I LOVED GI, and I did NOT love nephrology. This was also our last block of anatomy, which was bittersweet at the time, but now with all the extra free time I have, it is just purely sweet ;-). Don’t forget to check out everything else I learned in medical school! Here is Musculoskeletal, Neuro, and Cardio/Pulmonary! Pancreatic cancer is devastating. Often considered so deadly because such a small percent are diagnosed at a point when surgery could be helpful. The rest are diagnosed so late, that surgery isn’t a helpful option. Although the abdomen is complicated, it makes sense. I loved in anatomy that I was able to understand the flow of food, and visualize the absorption of nutritions. GI makes sense. We need food for energy, and our digestive system ensures that. Renal physiology is math. I’m not very good at math, so it was really challenging for me. This was by far one of the hardest exams I took this block, and in medical school in general. Gallstones are common, and most are asymptomatic! Many people have them their whole lives never knowing about them. And most people never have any issues from them, either! Your arteries are not symmetrical. Even the venous drainage of you internal organs differs from right to left, who knew! There are so many anatomical anomalies in different human bodies. Its really only appreciated in the cadaver lab, but it is amazing. 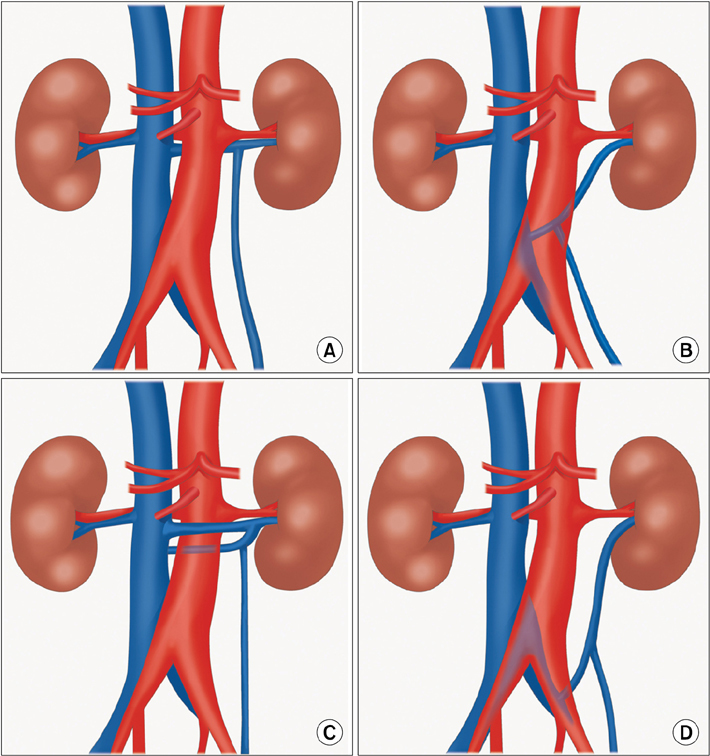 Here is an example of some of the different ways your renal veins can be attached. Your adrenal medulla and adrenal cortex (both part of the adrenal gland) are derived from completely different parts of the developing embryo. This makes it a pain in the but to try to remember the different nerve innervations! The vagus nerve is in charge of the innervation for most of your gut – but provides very “nonspecific” pain, making GI pain hard to localize. Which is why having abdominal pain can lead to an entire novel for a differential diagnosis. Often times the appendix is located NOT in the lower right corner, which is actually very important to know! So any complaint that sounds like an infection gets a CT, even if it is in a location that is not where the appendix typically is. Embryology is important, especially in GI block. The development of the gut is amazing, and I really think its something that is clinically relevant. This block really flew by quickly, and was pretty surface level knowledge. There are general surgeons, nephrologists, gastroenterologist, etc to deal with the field! So it makes sense that what we are taught isn’t very in depth (although it feels like it is). I really enjoyed this block but I’m ready to head on to Block 6 Endocrine/OBGYN!